A string of positive developments caused shares to rally. 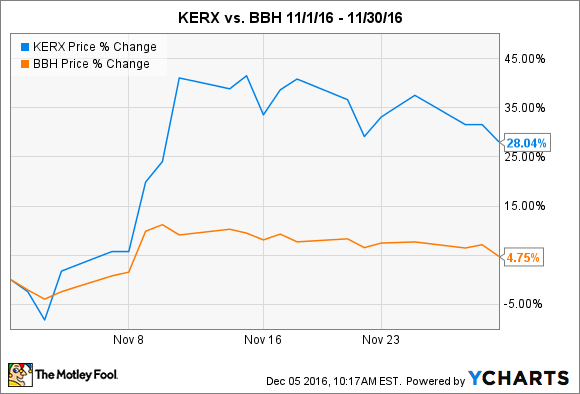 Shares of Keryx Biopharmaceuticals (NASDAQ:KERX), a biopharma focused on renal disease, rose more than 28% in November, according to data from S&P Global Market Intelligence. That move far outpaced the biotech sector in general as measured by the VanEck Vectors Biotech ETF (NASDAQ:BBH). Revenue declined 31% sequentially to $6.4 million. The drop was mostly owed to the previously announced supply disruption for Auryxia, the company's only approved drug. On the bright side, sales came in higher than the $5.5 million that market watchers were expecting. Net loss per share was $0.39, which was much worse than the $0.20 loss that the Wall Street had projected. Keryx finalized its sNDA application that could potentially expand Auryxia's labeling. The company plans on submitting the document for FDA review soon. While the financial results were mixed, the big news from the quarter was that a second contract manufacturer has been FDA approved to produce Auryxia. This news should resolve the company's supply disruption issues. A study of 3.5 million veterans was released during the month that linked constipation with chronic kidney disease (CKD). This results of this study could suggest that the market for treatments of CKD -- like Auryxia -- could grow faster than previously expected. Keryx presented data from its Phase 3 study using Auryxia to treat iron deficiency anemia and non-dialysis dependent CKD at the American Society of Nephrology's 2016 Kidney Week. All in all, it was a month filled with good news, so it is not hard to understand why shares skyrocketed. With Auryxia's supply issues now resolved, the company can once again focus its attention on building awareness and demand for the drug. However, that might prove to be a tough challenge given the company's recent missteps. After all, it is possible that providers who were impacted by the supply disruption might be left with a bad taste in their mouth and refuse to start new patients on the drug. Only time will tell how long it will take to win back their trust. Investors won't know the answer to that question until the company announces its fourth-quarter earnings results. Potential investors might want to remain cautious until then.